Callanwolde was originally the home of Charles Howard Candler, eldest son of Asa Candler, who succeeded his father as president and director of the family-founded Coca-Cola Company. It was named after Callen Castle in Ireland which was given to a Candler ancestor by the English crown in the 17th century. 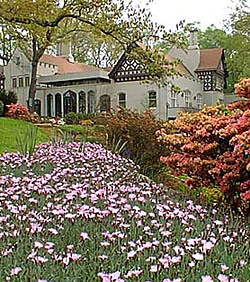 Built in the early 20th century (1917-1921), Callanwolde was designed by Henry Hornbostel of New York. Hornbostel also created the campus plan and several buildings for Emory University. From 1929 until his death in 1957, Charles Candler served as board chairman of Emory University. Callanwolde is a successful amalgamation of 19th-century Gothic Revivalism and 20th-century ideas of form and function. The front facade of this two and one-half story home has medieval half-timber rhythmical design across the upper stories, crenellated bays and Tudor arches. It was constructed with modern materials of poured concrete and steel and a rubble base of tile covered by stucco. Embodying the ideals of an open floorplan, most of the rooms have access to the great hall on each floor. The great hall is paneled in walnut obtained from W. M. Healy of Southern Railway, a friend of Candler. This wide paneling was used in Pullman cars and is unobtainable today. Two rear wings originally created an arcaded courtyard. In the 1980s, this inner courtyard was completely enclosed to provide more space for special events at the arts center (its current function). Originally a one-lane bowling alley was located in the basement; however, this area is now used as a pottery studio. The home has an Aeolian music system especially designed for the house and installed during its construction. Consisting of seven divisions, the instrument is contained in four separately constructed chambers strategically located throughout the house. Decorative ornamentation in the ceiling and walls of the mansion conceals the chambers. The most spectacular of these ornamentations, a system of rib vaults elaborated with an intricately designed pierced tracery constructed of pre-cast masonry grillwork, is located in the ceiling above the grand staircase. Controlled from the console located in the first floor great hall, all chambers can be utilized simultaneously or separately, permitting selective projection of sound to all major rooms in the mansion. While basically an electric powered wind pipe organ, simulation of five or six different instruments can be presented from the keyboard of the console. 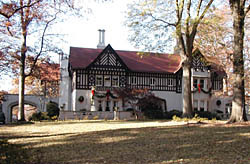 Callanwolde was used as the Candler home until 1959; it has since served in the educational program of the First Christian Church of Atlanta, as an artist studio, and now, the Callanwolde Fine Arts Center. Callanwolde is located at 980 Briarcliff Road, NE in Atlanta. The Callanwolde Fine Arts Center frequently hosts concerts, performances, readings and other special events. The second floor art gallery features exhibits by local artists, and is open free of charge Monday - Friday, 10:00am to 8:00pm, Saturday 10:00am to 3:00pm. Call 404-872-5338 for more information or visit the website.